When I was a kid, on the day after Thanksgiving my mom and dad would take me to Chicago to see the Christmas lights and decorations on Michigan Avenue. I felt like a grown up in the bustling big city, bumping into ladies in high-heeled boots and fur coats, and men carrying stacks of big department store boxes and fancy-looking shopping bags. The men wore overcoats, galoshes and felt hats. I was accustomed to guys in Milwaukee being more casual, and mostly wearing hunting outerwear and plaid flannel hats with earflaps. 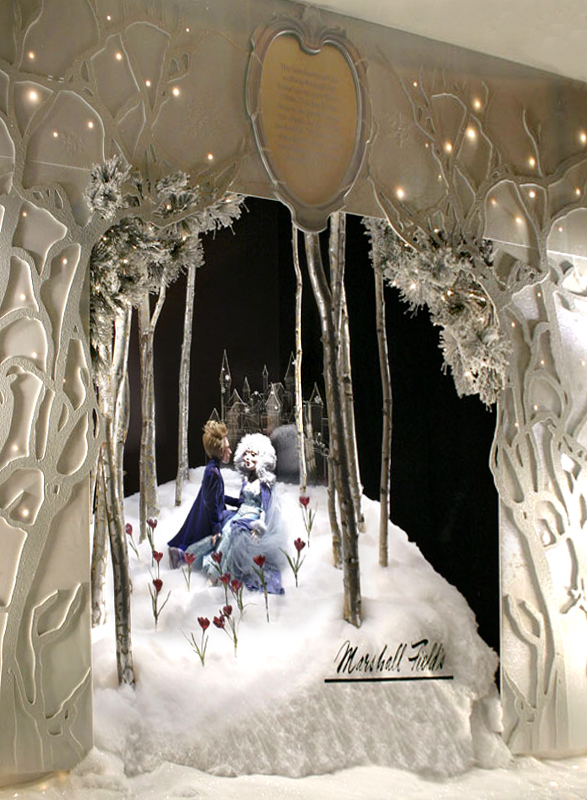 On State Street, Marshall Field’s had the best window displays ever, with animatronic elves, reindeer, Santa and Mrs. Claus, and princes kissing the noses of princesses in an enchanted flocked forest. Although primitive by today’s high-tech standards, the mechanical creatures moved with convincing agility. I can only imagine what I looked like from their perspective—a little girl, mouth agape, wide-eyed and mesmerized. Inside, the store boasted the famous seven story “Walnut Room Christmas Tree.” I tried to Google the exact height, because seven stories seems awfully tall, but my mom confirmed it was 70 feet, and we are sticking to that memory story. Just when I thought it couldn’t get any better, we’d stop for lunch at The Berghoff, an old school wood-paneled restaurant dating back to 1898, when it began as a men-only saloon that served free corned beef sandwiches with the purchase of a stein of Berghoff beer. The place would be packed with people that looked to me to have stepped from the set of a movie—elegant, sophisticated and perfectly coiffed. I was accustomed to camo snowmobile suits and boots. It was a rarity to see a taxicab in Milwaukee, and Chicago’s El was beyond compare. Everything about the big city—the cultivated people, the cabs, the crowded sidewalks and tall buildings, was spellbinding. Maybe we all become jaded as we get older. I’ve traveled all over the world and seen things I couldn’t have imagined when I was a child, but I also think people have forgotten about magic. Magic isn’t getting up at 3AM for a door-buster sale. Magic is putting on your nicest clothes to go window-shopping. We didn’t have a lot of money, and things were way more expensive in a big city like Chicago. But we went into Neiman Marcus and Saks and Marshall Fields because they had the most incredible Christmas decorations. It smelled special in those places, too—different than Gimbels and Sears, and Goldmann’s, on the south side of Milwaukee. It smelled like magic, although it was probably just Chanel #5 and Aquanet. I realize that the world has changed a lot since I was a child. In almost all cases both parents must work in order to support a family, and finding a good deal on Christmas gifts, if you’re lucky enough to have any disposable income at all, is an essential part of the holiday season. I can honestly say that I do not remember a single Christmas gift from my childhood, but I can recall as though it were yesterday how I felt when we went to Chicago to look at the decorations. Maybe the real “gift” was the fact that my mom didn’t have to work, and my dad closed down his business for the full four-day Thanksgiving holiday. We could afford the gas to drive to Chicago, the parking, and the lunch at the Berghoff. I’m sure someone bought something while we were in Chicago, but I don’t remember any of that. The experience, however, stays with me to this day. I can afford Chanel #5 now, and more than a love of the fragrance itself, I remain transformed by the memories it conjures, and how lucky I was when the day after Thanksgiving was magical. 1. Get the Associated Press Stylebook. Best investment ever if you’re determined to have people take your written word seriously. AP style, as it is lovingly referred to, is a standardized way of writing everything from dates to street addresses to job titles, and for-the-love-of-Mike, the correct number of spaces between sentences. Hint: it’s ONE! “Why was it necessary to have two spaces between sentences when using a typewriter? On a typewriter, all the characters were mono-spaced; that is, they each took up an equal amount of space. The letter “i” occupied as much space as the letter “m.” Because characters were monospaced, inserting two spaces after periods helped to visually separate one sentence from the next. “In the 17th-century some literary panjandrums wanted to make English conform to Latin, which does not permit ending sentences in prepositions. Grammarians and teachers, two groups of people who love themselves some rules, latched on to this diktat—and that was that. 4. Do not turn off spellcheck. It is smarter than we are. 5. 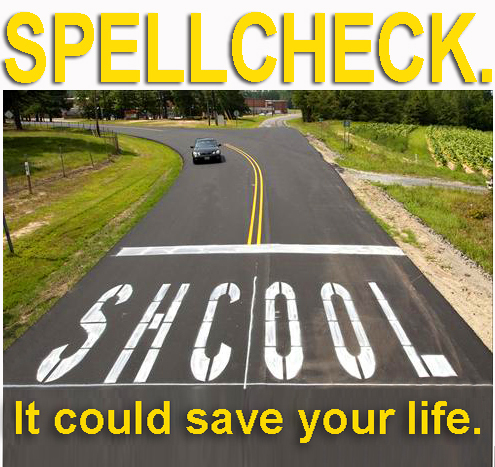 Use spellcheck. It’s right there where the words are. 6. Spellcheck is your best friend. Fighting it is futile. Embrace it. 7. Double check the spelling of proper names. People, products and places, like Llanfairpwllgwyngyllgogerychwyrndrobwllllantysiliogogogoch, Wales. Took 20 minutes, but I’m 85% certain I spelled it correctly. 9. Use the thesaurus. It is a staggering resource, but one must administer abstemiousness, forbearance, curtailment and suppression or one will sound like a muttonhead. For real. The thesaurus is a great tool for expanding the vocabulary, but be sure the words you choose sound like they come from you and not your obnoxious brother-in-law from Sheboygan who looks pretentiously over the top of his glasses while spouting $7 words that he mispronounces in an English accent when he gets drunk. We unjustly malign procrastinators. Isn’t it better to say, “I am going to wait until I can give 100% to this task” rather than being shamed because the laundry pile has moved across the room of its own accord, and the checkbook hasn’t been balanced since Birkenstocks were popular the first time? A person is more likely to be accurate to the penny, and separate colors, if she is fully invested in the task. No one calls hostage negotiators and bomb defusers procrastinators, yet they don’t dive into action willy-nilly. Politicians, prosthetic limb fabricators and people who write books all take their time before presenting the world with their stuff or we’d be lurching about, reading the back of air fresheners, and carrying our taxes in a bandana tied to the end of a stick. Measure twice, cut once. Is that to postpone cutting, or is it just common sense? I betcha there are people who’ve been labeled as procrastinators, who don’t hesitate before putting out a hair fire, or eating a chocolate chip cookie right out of the oven even though they know they’re going to blister the roof of their mouth. If you take a moment to think before acting (which includes opening your mouth and flapping your lips) you reduce the likelihood that you will need to say “I’m sorry” for an ill-conceived remark that makes you look like a jackass. 2. You won’t be labeled a flip flopper. Rush to action and there’s a good chance you will need to repeal your decision. It’s one thing to change the date of a dinner party or angioplasty, but blue eye shadow can’t unbuy itself, and sleeping with the cute bartender at The Dew Drop Inn is not reversible. He’ll think you two are “going out,” and no decent man will have you. 3. Your lack of response can be construed as deep thinking. Use your head on this one. No one will confuse you for an intellectual colossus if you hesitate when asked whether you’re drowning, think puppies are cute, or would like to order the Lutefisk. On the other hand, if you close your eyes and nap briefly when asked to head up the 4th grade bake sale, people will think you’re mentally tabulating the costs and benefits associated with such an endeavor. They will never know that you have “checked out” in the hopes that they will find another sucker before you wake up. Similar to “deep thinking,” when you delay, postpone or put off action on a wide variety of fronts, things have a way of sorting themselves out. No good will come of you introducing a bill that makes it legal to shoot old people who watch The Voice just so they can say the word caterwauling over and over. Give it some time and they will die out before Pharrell starts buying adult-sized sweaters, and your rep as a circumspect “good egg” remains intact. If given a few days, most ugly situations improve with the passage of time, and no action is ever required. I don’t suggest you finish reading The Pet Goat if someone is shooting at your head, but in cases of arguments, disagreements and differences of opinion—the stuff on which most of the upheaval between humans is predicated—chillax. Take a breath. Rarely does rushing headlong into a shitstorm help matters. 5. You’ll live a longer, healthier and happier life. “Just do it,” advises Nike. An ad for Delta Private Jets tells us, “Perfect moments are often made on a moment’s notice.” This is not happiness, health or security. It’s impulse buying, which has nothing to do with longevity and everything to do with corporate greed. Wanna live well? Take your time. Look around. Slow down. 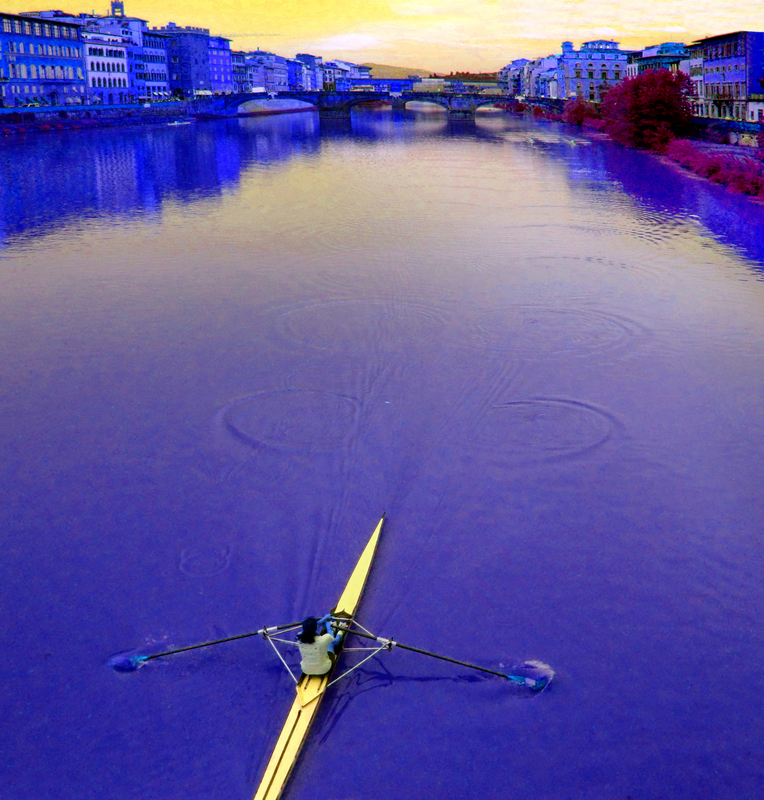 Go to Italy. You’ll avoid broken toes, spilled milk, hurt feelings, and indigestion. By all means get your homework done on time, don’t leave the kids at soccer practice past midnight, and get a mammogram. Beyond that, think before you act or speak, avoid fast food, and don’t do anything that you wouldn’t do a day from now, if you thought about it. And now you can listen to Pam’s essay series “Wisconsin Tough” on Public Radio. I loved Just Kids beyond measure. If there was a word stronger than love, I would use it to describe my feelings for the that book, so my expectations for M Train may have been a tad unrealistic. Written in a far more “stream of consciousness” style, M Train didn’t pull me into the story–an era, a lifestyle, a heartbeat, the way Just Kids did so poignantly. M Train takes a lot of thought and brain power to read, which is not necessarily a bad thing, but I didn’t feel that compulsion I had with Just Kids to keep hungrily turning the pages. Smith’s choice of words is again, and as always, remarkably strung together to incite an emotion, or help the reader visit a place with which they are unfamiliar. M Train is worth the read – Smith’s style is unique, and in the case of M Train it’s like looking at a complicated painting. It takes a bit of time to deconstruct the work and really think about it in order to interpret a meaning. It’s pretty cool that we can draw our own conclusions about meaning from a work like M Train v Just Kids, which tells us a story in a more traditional (but gorgeous) way. #1. Can be slid beneath something uneven, like a table leg that is an inch or so short, or my Uncle Ray, who due to his imagination believes one leg to be substantially shorter than the other. He has had the heels of his left shoes built up by a solid inch and a half, and thusly he now lists to the right. 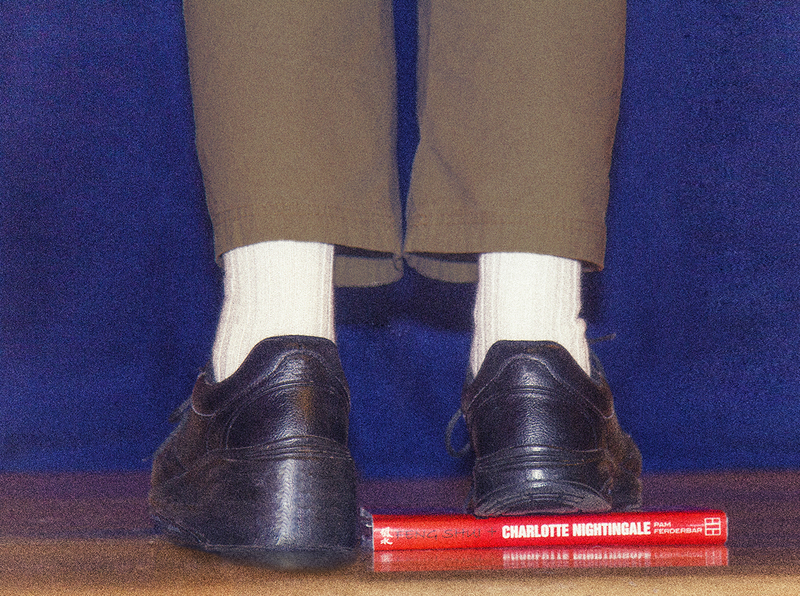 A funny book beneath his right foot would even things out. #2. Can also be used to hold a window open, keep a door ajar, as a cocktail coaster or a trivet beneath a cabbage dish or a broasted chicken. #3. Can be wielded as the blunt object so often referred to in crime scene investigations, with an almost certain guaranty that the police will not suspect the “funny book” of being the murder weapon. “Cause of death?” asked the detective. “Geez, you’re grim, humorous, ornery and boring,” said Elaine to Dan. Elaine immediately removed her blouse. A study conducted by Psychology Today revealed that nothing is more highly valued than a sense of humor, perhaps even more than looks, intelligence and money. Someone with a great sense of humor, it is reasoned, is happy, socially confident and has a healthy perspective on life. You rarely see a Match profile demanding potential mates possess smokin’ abs and earn seven figures (although this is generally understood), but everyone wants a partner with a bangin’ sense of humor. Never mind that comedians get divorced at the same rate as coconut safety engineers, and are often as socially awkward as anthropophobics. ♥Anything written by David Sedaris, but especially Dress Your Family in Corduroy and Denim and Me Talk Pretty One Day. I tinkle a little bit every time I reread one of his books. ♥Mindy Kaling’s book is truly hilarious— Is Everyone Hanging Out Without Me? Funny. Funny. Funny. ♥Let’s Pretend This Never Happened (A Mostly True Memoir) by Jenny Lawson. So down-to-earth and “real” that you can’t help but see yourself in the awkward situations that have defined Lawson’s life thus far. ♥A classic, Catch-22 by Joesph Heller takes comic relief to dizzying, brilliant and poignant heights. If you read it in high school, reread it again now. ♥For anyone who has ever known a child, Go the F*ck to Sleep by Adam Mansbach. I laugh just thinking about it! ♥The Wit and Wisdom of Oscar Wilde. He elevated snark to an absolute art form. You’ll find dozens of bon mots here with which to amuse and abuse guests at your next cocktail party. ♥Fear and Loathing in Las Vegas by Hunter S. Thompson. Sigh. Lurid, brash—a masterpiece. And no, the movie isn’t a gazillionth as funny. Got a funny book to share with us? Do tell!